Edmund Bede (Ted) Maher, grazier and businessman, was born at Forbes, New South Wales, on 8 June 1891. He was the son of Lawrence Thomas Maher, a grazier, and his wife Anne, née McKeon. He was educated at convent schools at Forbes and Grenfell and at the Grenfell Superior Public School, leaving at the age of fifteen to join the Postmaster-General’s Department, where he worked as a telegraph messenger in Sydney and country districts. In 1911 Maher resigned to join the firm of Pett and Kearney, stock and station agents of Bogan Gate, New South Wales. By 1914, Maher was employed in the accountancy division of the International Harvester Company, moving to Queensland in 1917 as the company’s connection manager. By 1921 he was in partnership with W. C. Wilkinson, in the firm of Wilkinson & Maher, involved in a number of pastoral and business interests, including rabbit freezing works at Yelarbon and a cattle and sheep station known as Broadmere, near Taroom in the central west of Queensland. On 24 March 1923 he married Mary Augusta (May) Crowe at St Vincent’s Catholic Church in the Sydney suburb of Ashfield. Some time before he entered the Queensland Legislative Assembly in 1929 representing Rosewood (later West Moreton), Maher had joined the Country and Progressive National Party, formed in 1925 as a merger of other country groups. At a conference in Brisbane in May 1936, he is reputed to have successfully negotiated a settlement whereby the Parliamentary Country Party agreed to work to bring about ‘the formation of one strong Country Party’ throughout the state. On 15 July he became leader of the Country Party and Leader of the Opposition in the Assembly, holding these positions until 1941. In 1947 he became the party’s deputy leader. From the first, he had given ‘authoritative discourses on land and pastoral matters, delivered in a powerful speaking voice, and revealing a pleasant personality’. He would become a seasoned warrior, his first speech, in August 1929, having been given amid a spate of interjections from the Opposition, while in the early 1940s he was renowned for his verbal battles with Labor Premier William Forgan Smith. In March 1949 he strongly opposed increases in the size of the Legislative Assembly and on 18 August tendered his resignation as Deputy Leader of the Opposition. On 27 October Maher resigned his seat in order to become a Country Party candidate for the Senate. A popular figure in conservative ranks in Queensland, Maher led the Queensland Liberal–Country Party Senate team at the federal election of December 1949 to be elected in first place. As an indication of his extensive parliamentary experience, he became a temporary chairman of committees almost immediately (1950–51). 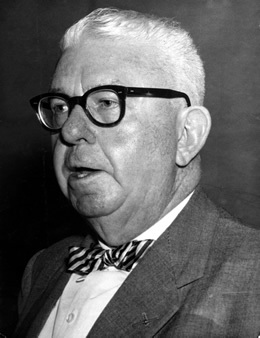 Maher gave his first speech in the Senate on 23 February 1950 on foreign affairs and national development, pointing out that some states, particularly Queensland, were ‘in dire need of improved road and rail communications’. He praised the Menzies Government on its appointment of a parliamentary joint committee on foreign affairs, a decision reflected in resolutions passed by the House of Representatives in October 1951 and the Senate in February 1952. In 1951, Maher, along with Senator John Gorton, the ALP Leader of the Opposition, H. V. Evatt, and his deputy, Arthur Calwell, had met with the Liberals’ Minister for External Affairs, R. G. Casey. Maher later described the discussions as ‘animated’, and recalled Evatt’s support for the appointment of the proposed joint committee. The committee met for the first time on 5 March 1952, Maher becoming a foundation member and serving until the conclusion of his time in the Senate in 1965. For brief periods in the 1950s, he was vice-chairman. In 1962 Maher referred regretfully to the fact that there were still no Labor members. ‘It is’, he said, ‘a good thing to have a refreshing, opposing line of thought’. The ALP finally joined the committee in 1967. ‘Remember what Simonides said—that he never repented that he had held his tongue, but often that he had spoken’. It is easy to assess the position of faraway events incorrectly, and I have often preferred to remain silent rather than express a firm opinion on delicate and highly explosive subjects. However, I have given some thought to the problems of South-East Asia, and particularly to the bill before the Senate. Maher went on to express his support for the bill and the military commitments involved in ratifying the Treaty. He believed that it was essential for Australia to become more assertive in the field of foreign affairs, if the nation was to realise its potential and withstand what he regarded as the world threat of communist ideology. Maher was part of a growing and influential group of senators who were highly committed to upholding the accountability of the executive to the Parliament, and actively participated in Senate committees. On 25 September 1953 the Joint Committee of Public Accounts tabled its fourth report, which related to Prime Minister R. G. Menzies’ newly established Department of National Development. The committee, described as ‘non-partisan’, had a majority of Liberal–Country Party Coalition senators and MHRs, but this did not prevent it bringing down a critical report on the new department, then headed by the prominent Liberal powerbroker, Senator Spooner. In the Senate debate on the committee’s report, Spooner, polite but obviously angry, sought to discredit the committee by claiming the report was inaccurate. The Liberals’ Senator Paltridge, affirming that the report had the unanimous agreement of the committee, confessed that the committee had decided that none of its members should answer criticism in either house. Amid some bewilderment on the part of senators, Maher congratulated the committee on its report, mentioning that the committee’s object was to restore control of the purse to the Parliament. He believed that the report (and its successor) contained ‘a very severe indictment of bureaucratic extravagance and mismanagement in the Department of National Development’, a department, he considered, that would not be any great loss were it abolished. Maher suggested that all government departments should report to Parliament annually, a requirement which did not then exist. His view went virtually unheeded, though the issue was raised later by the Boyer Committee. Maher was ahead of his time. The mandatory reporting requirement for Commonwealth departments was not introduced until 1985. There seems little doubt that Maher connected the debate on the national development portfolio with states’ rights, ever to the fore in Queensland. National development, in his mind, was linked with centralisation of power in Canberra. In 1954 he spoke against Commonwealth bureaucracies duplicating those of state bodies on the grounds that one of the functions of a senator was to stand up for the rights of the states against ‘threatened invasion’ from the Commonwealth. He spoke frequently on Queensland matters such as rail standardisation, joining a Liberal Party committee on that subject in 1956. He believed that national expansion should take place, not just in ‘big’ states such as New South Wales, from which Spooner hailed, but ‘in close and friendly co-operation’ between the states and regional authorities, so that states such as Queensland would have better transport and mining facilities, which would improve production at localities such as Mount Isa, Townsville and Weipa. Probably taking aim at New South Wales, he complained of vast sums of money invested ‘in some States that have not the potential of Queensland’. He felt sad that Queensland was losing out in the race. Maher was interested in the new states movements that were active in New South Wales and Queensland, and in 1950 he was involved in discussions with other parliamentarians concerning the formation of an all-party committee to examine constitutional issues. This foreshadowed the establishment of the Joint Committee on Constitutional Review six years later. Maher did not contest the Senate election of December 1964. Six feet tall (183 centimetres) and of solid build, he possessed a well-stocked mind, the product of prodigious reading. Country Party historian Ulrich Ellis described him as ‘a constructive critic and a capable parliamentarian’. In his mature years, he proved less fiery than he had been in the Queensland Legislative Assembly, where he was once suspended for assault, and on another occasion fined for contempt of court. Although he did not contribute frequently to deliberations in the Senate, Maher was a clear and stylish speaker whose vigorous speeches make easy reading. Maher, who was appointed CBE in 1966, died at his home at Bribie Island, near Brisbane, on 31 December 1982, at the age of ninety-one. Following a Requiem Mass at St Paschal’s Church, Wavell Heights, he was buried in the Pinnaroo Cemetery. Divorced from May (who died in 1985), Maher had married Esmée Slaughter on 7 March 1980 at Tweed Heads Registry Office, NSW. He was survived by his son from his first marriage, and by Esmée. His brother, R. S. Maher, joined the Australian Labor Party in 1927, serving as an MLA in New South Wales between 1953 and 1965 and as Speaker of the New South Wales Parliament from 1959 to 1965. Brisbane Courier, 13 May 1929, p. 18; Australian Country Party Monthly Journal (Syd. ), 1 Aug. 1936, p. 8; Clem Lack (ed. ), Three Decades of Queensland Political History 1929–1960, Government Printer, Brisbane, 1962, pp. 637–8; W. Farmer Whyte (ed. ), The Australian Parliamentary Handbook, A & R, Sydney, 1952, p. 259. Australian Country Party Monthly Journal (Syd. ), 1 June 1936, pp. 4–5, 13, 1 Aug. 1936, p. 8; Lack, Three Decades of Queensland Political History 1929–1960, pp. 145, 197, 786; Ulrich Ellis, A History of the Australian Country Party, MUP, Parkville, Vic., 1963, pp. 228–9, 243, 258–9, 282; QPD, 22 Feb. 1983, p. 3043, 22 Aug. 1929, pp. 42–4, 5 Sept. 1940, p. 244, 25 Sept. 1940, pp. 354–77, 8 Mar. 1949, pp. 2012–15, 31 Mar. 1949, pp. 2388–91, 2400–2, 2410–17, 1 Apr. 1949, pp. 2422–4, 2447–8. CPD, 23 Feb. 1950, pp. 41–4, 27 Feb. 1952, pp. 393–4, 18 Oct. 1951 (R), p. 894; Senate, Journals, 27 Feb. 1952, pp. 145–6; Derek Drinkwater, ‘Catspaw of the Minister? : Membership of the Joint Parliamentary Committee on Foreign Affairs, 1952–1967’, Legislative Studies, Spring 1994, pp. 56–65; CPD, 15 Mar. 1962, pp. 551–4; CPP, 132/1952. CPD, 9 Nov. 1954, pp. 1264–9; CPP, 207/1953, 213/1953; CPD, 16 Oct. 1953, pp. 637–43, 646, 21 Oct. 1953, pp. 728–30. CPD, 12 Aug. 1954, p. 190, 23 Feb. 1950, pp. 43–4, 26 Mar. 1957, pp. 158–63; CPP, 60/1956; Ellis, A History of the Australian Country Party, p. 302. Lack, Three Decades of Queensland Political History 1929–1960, pp. 638, 671–6; Ellis, A History of the Australian Country Party, p. 258; Bundaberg Daily News-Mail, 7 Mar. 1941, p. 5; QPD, 22 Feb. 1983, pp. 3042–4; Courier-Mail (Brisb. ), 4 Jan. 1983, p. 10; CPD, 3 May 1983, p. 102. This biography was first published in The Biographical Dictionary of the Australian Senate, vol. 3, 1962-1983, University of New South Wales Press Ltd, Sydney, 2010, pp. 292-295.